My dad, my step dad, my sister and I went to a concert in Dublin, CA one night about 2 months ago. I brought my camera along for the fun of it and after the concert we stopped by to visit my grandpa's grave in the Dublin Graveyard. My sister and I got a creepy feeling and didn't want to go in, but my dad made us. He had me take a picture of the grave stone, so I did. Are the streaks in the pictures evidence of ghosts? The Graveyard was cold and pitch black at 11:30pm when we got there. No cars anywhere nearby and no street lamps, stray lights or even buildings nearby to get in the pictures. After the two of the gravestone I took one of my sister and then of my dad. I hadn't looked at the pictures yet and my dad asked my sister to take one my dad and me in front of a tree, so she did. We felt even more scared and wanted to run back to the car, but then she looked at the picture of my dad and I and got freaked out. She handed the camera back to me and asked if it was broken and I said no as I looked at the picture. In front of my dad and I there were swirls or white and orange, vortices. I looked back through the rest of the photos I had taken and was even more in shock and scared out of my mind when I saw orbs and more vortices in all of the pictures. I ran to the car and me and my sister yelled at my dad to get in the car and drive. I took a picture in the car to just test and see if it was my camera, if it had broken or had something wrong with it. It was fine, no swirls or lights or orbs. Then we went home. There are 4 pictures of vortices and 2 of my grandpa's gravestone. All taken in the graveyard in Dublin, and happens to be the same graveyard that the Donner Party is buried in. A random gravestone and my dad standing in the back to the right, you can somewhat see his shoes. Then my sister took the picture of me and my dad. and the last picture I took accidentally without the flash. It was suppose to be of my dad and step dad. Hope this helps you prove anything. I believe that shirt the hippie is wearing is scarier than the pictures. I just wanted to say that since these photos have been up for a few years now, Ive also taken more photos with the same old camera and my new cameras ive gotten. I have still no idea or reasoning for the event of that night, but I do know what some of these comments below mine have mentioned. I see how if a camera is not still and is pointed at any lights, it will make swirls similar to the ones in my photos. That does not explain my original photos since there were no lights any where around at all. Just pitch darkness. Anyway, thank you to everyone. This is interesting to look back on this experience and see the comments here. ok so i have seen a photo like this before my cuzin had a pic of her bro and he had lines of that color showin up on his face and his legs two weeks later he crashed and smashed his legs and his face pretty bad. idk if its a coincdnece but thats the only other time i have ever seen spiritual markings in photos of that nature. What you captured is ectoplasm. It means you had a ghost, perhaps your grandfather trying to manifest himself. Seen it many times in graveyards. The pics are really interesting and the girls are really good looking, seriously. :) so creepy! My camera does not have a night vision setting. But thank you very much for the comment on the photos. They did turn out fairly nice. Grea pic I am not to sure if any of you familler with super charge orbs? They look like bright lights that are spirit orbs that has been charge were they can light up.I heard to that digitale cams in the the dark that they they make a electric discharge and show up in cam fron he chips. But they are really cool pictures regardless of what they may or may not be. I felt very calm as I viewed them, not that that would mean anything. I would just take it as a lovely hello from your grandpa. These are just cool pics... No matter what it all ends up being... It sure is pretty! I think that the way this is written shows that it's not a fake. The last photo is especially interesting to me. On the left it looks like an angel flying. I think this is one of the best I've seen. Just your loved one saying "hello"
I have about 100 pictures with these same things in them that I took at some local cemeteries. I find them very interesting. Everytime I catch these, my camera which is digital the batteries die quickly which I think means that these are spirits. I love looking at these pictures. 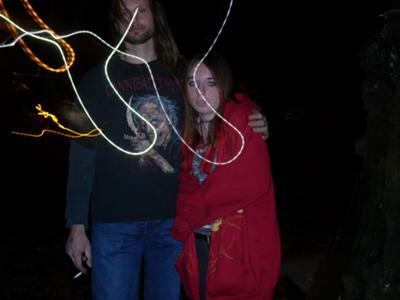 I've been told by paranormal investigators in my own experience with paranormal pictures that these streaks of light (referred to as spears) are just as much as sign of a ghost as orbs, full apparitions, shadow people, etc. Those lights and streak didn't freak me out as much as that shirt that guy is wearing did. Where did he get that? It could be that that shirt may have made restful spirts restless. You can tell her what you think, but geez people I can tell by the way she writes that she was only wondering. I highly doubt she was trying to dupe the world. You can clearly make out the braiding in the camera strap (upper corner) in the image of the daughter and father and in the one with the pink orb the man with the cigarette is in the background. You can make out his shoes and legs chances are his smoke made the "light streaks." Well evidence is hard to prove when one of the parties is smoking. also is the strap accounted for and how about the free flowing hair of the child by herself. Also the pic of the headstone is laughable because the flash of the camera on the clearly polished and reflective surface probably caused the "orb". Clearly awesome work if not for the smoking and untied hair. Hope this makes sense to you people. This is my camera info though. You Don't Have To Stay! I appreciate you being here and chatting with us, but your comment below is slightly snide and condescending. You obviously think you're of loftier stock than we are. If you are above us, please find a place to belong. I love having you, but condescending remarks are rude, quite frankly, and I won't have it. You also obviously don't know where you are and what this site is about. Yes, indeed grandpa never looked better. Think the grave agrees with the old fart in a morbid fashion that is. I found the images to be utterly ridiculous easy to fake too. After reading some of the comments I find them all to be two-dimensional lacking that genuine paranormal validity of this so-called supernatural occurrence. I think the pics are pretty cool and I saw a pink round orb in one. You shouldn't be frightened though if it's a sign your Grandpa and/or other relatives knew you were there. You'll always find those who dismiss the strange colored lights as slow shutter speed. Humbug! Boy, you're quick on the draw. I just want to say that I doubt these are bugs. This is California and it's not that buggy here. Look at Destinee. She's wearing a coat. I can vouch for the fact that we've been hit with a very cold winter and I highly doubt there were that many flying insects at night. In fact, I don't even see them much during the daytime yet. Now flash problems, that very well could be the debunk we're looking for. Thanks for that! Next time you go there, bring a tripod and shoot pictures without the flash on. Unfortunately, a flash unit that is set to auto at night will provide a very long flash time. At night there are a ton of flying insects that will reflect the flash light and if your camera goes to a slow shutter speed (which it will at night) you will get the orbs and all the light distortions that your pictures showed. Thank you for your pic(s). I'm not sure what that is in your images. Could you please tell us what kind of camera you were using? Include the model and the resolution, please. That will help us determine what you've got here. Thanks again! Join in and write your own page! It's easy to do. How? �2006-2011 Ghostsandstories.com. All rights reserved.